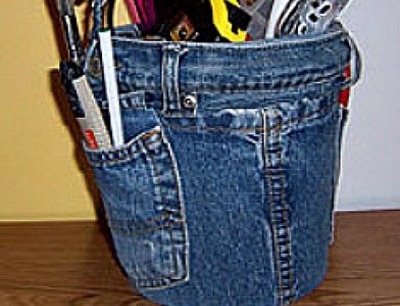 For heaven's sakes, don't throw those old jeans away! 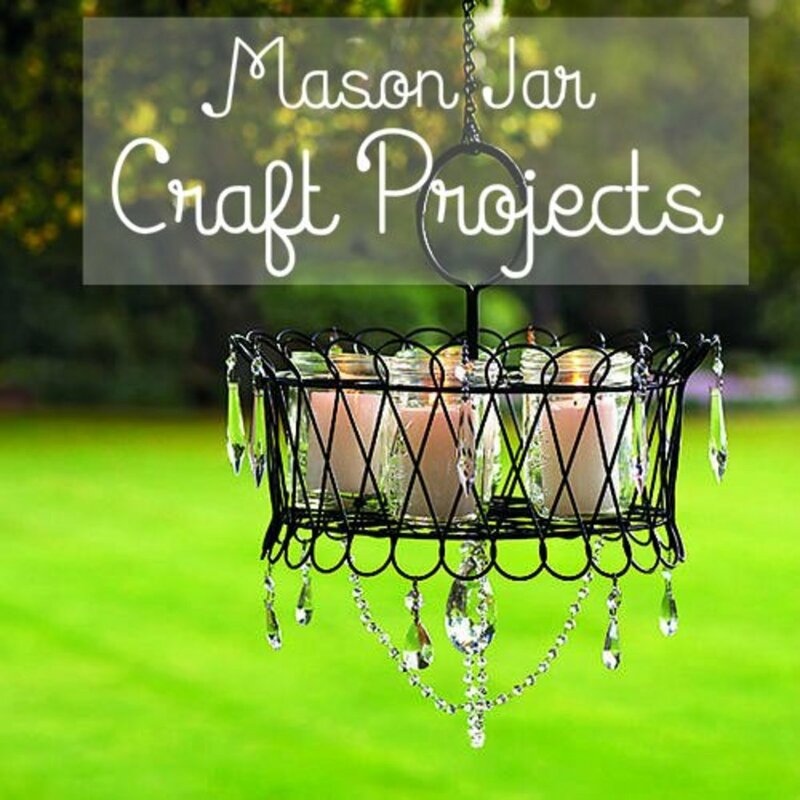 These crafts are awesome and easy to make. 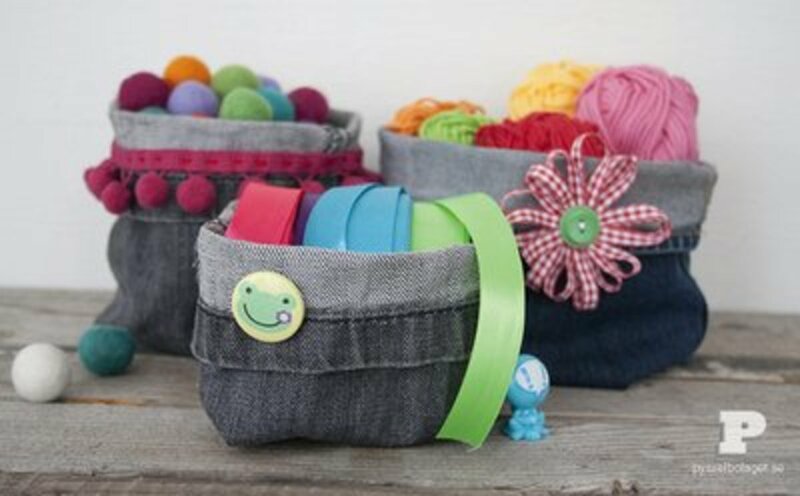 Crafts using old jeans include aprons, purses, flowers, pompoms, and many more denim crafts. 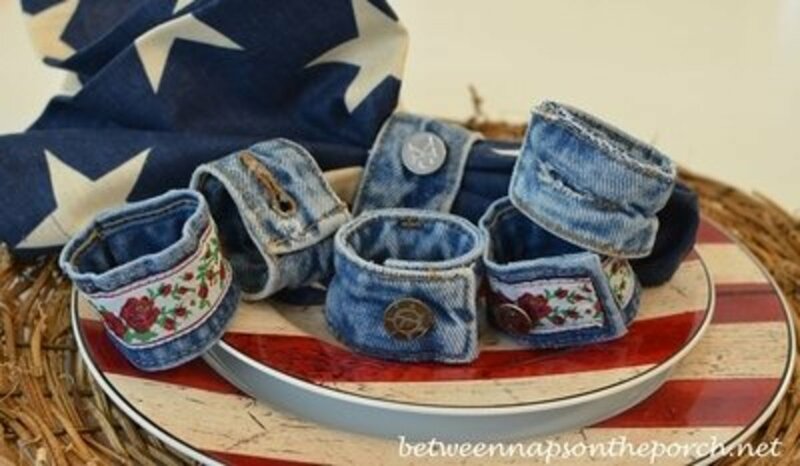 In this article you'll find pictures of the jeans crafts, plus directions on how to make them. To make the beautiful apron shown above, go to Mommy Knows for the instructions. Probably the last part of the jeans that you'd use would be the seams, and this is a beautiful way to use them. 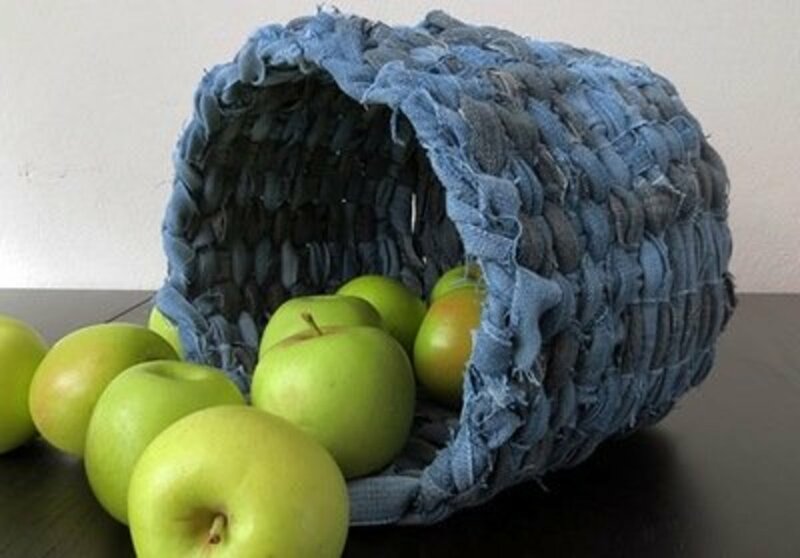 When you go to the eHow site you'll see how easy it is to make this outstanding denim bowl. 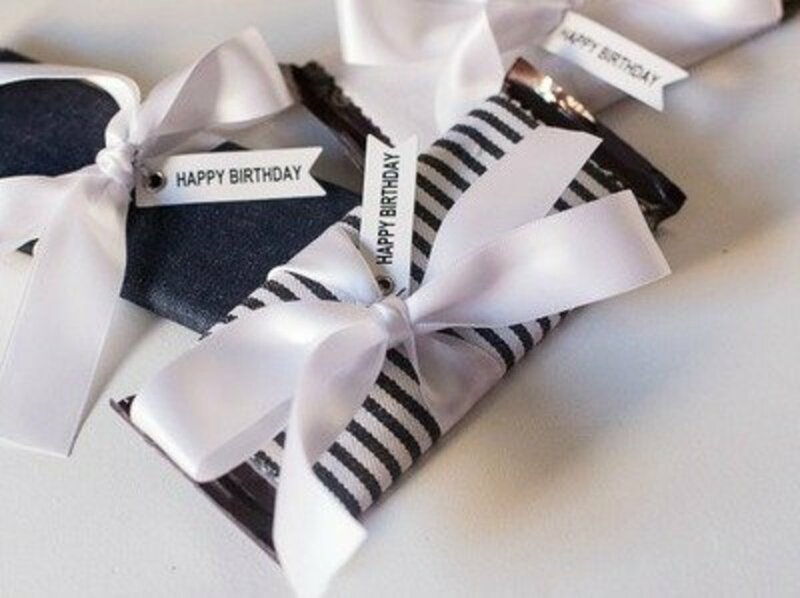 These very attractive candy wrappers are appropriate for favors for a birthday party, or any other occasion. 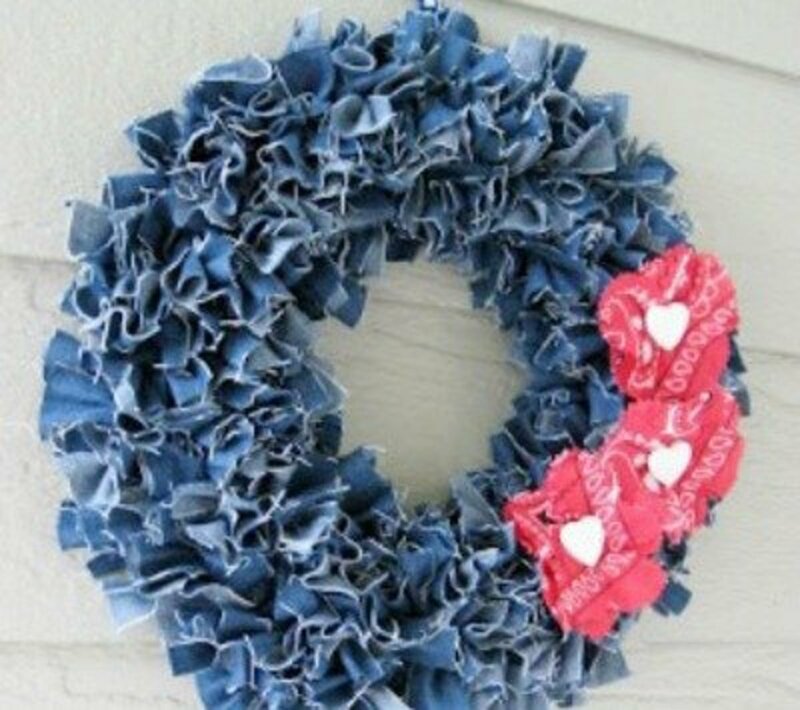 Find the tutorial for making these denim candy wrappers at Just Destiny. This is a really fun and unique way to present party favors. I love these little chair covers. They are not only useful, but also washable, which is an important feature when making something for the kids. You'll find the instructions for making the chair covers at Paging Fun Mums. These would be so cute for a classroom. If you want to have a unique way to gift a bottle of wine, check this project out. This would be a perfect gift for a housewarming or holiday home gift. 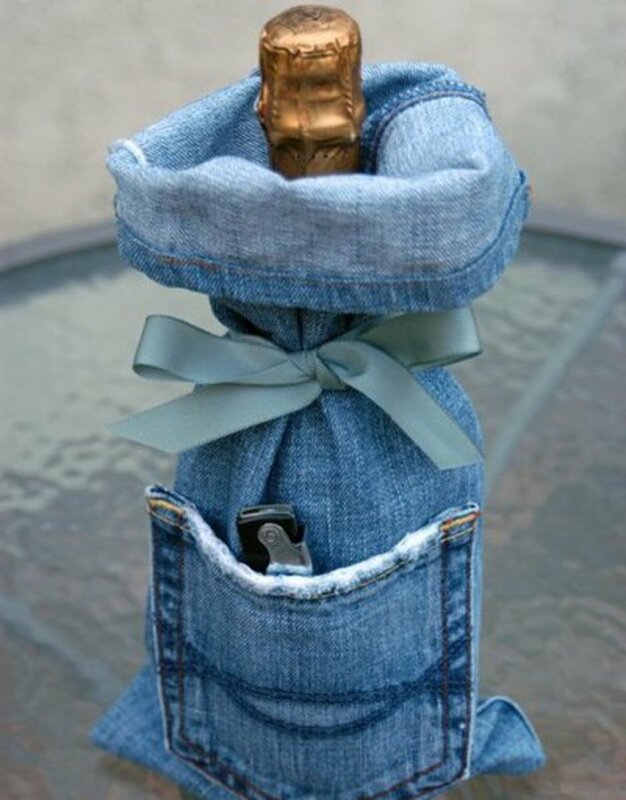 CATHIE FILIAN is the place to go for the tutorial to make these denim wine bags. 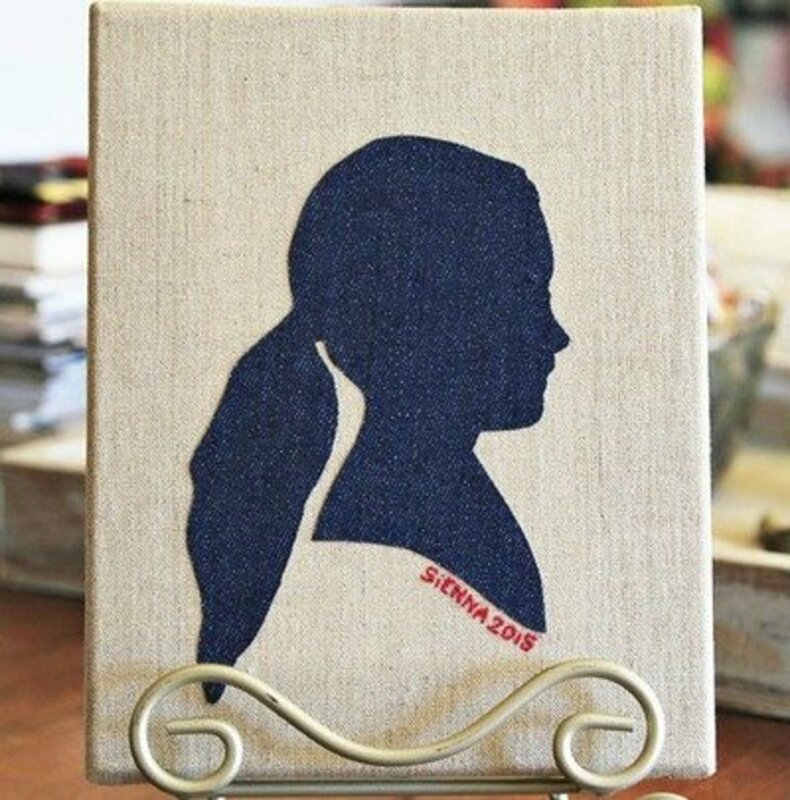 I can't think of anyone who wouldn't appreciate this silhouette art. It is an outstanding idea for a baby's room, a teenagers room or for any age between. The easy to follow instructions can be found at LITTLE BLUE BOO. You can use a denim shirt to cover a pillow without cutting it. Then if you decide to wear the shirt again, just remove the pins and press. You'll find the tutorial for making this shirt pillow at The Country Farm Home. This is a very attractive decorator pillow idea. I'd say this look is definitely more chic than shabby. 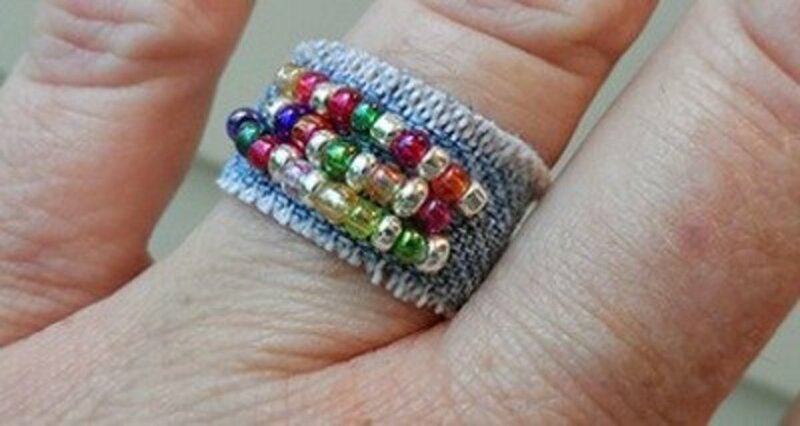 It is a pretty and useful way to use worn out or too small jeans. 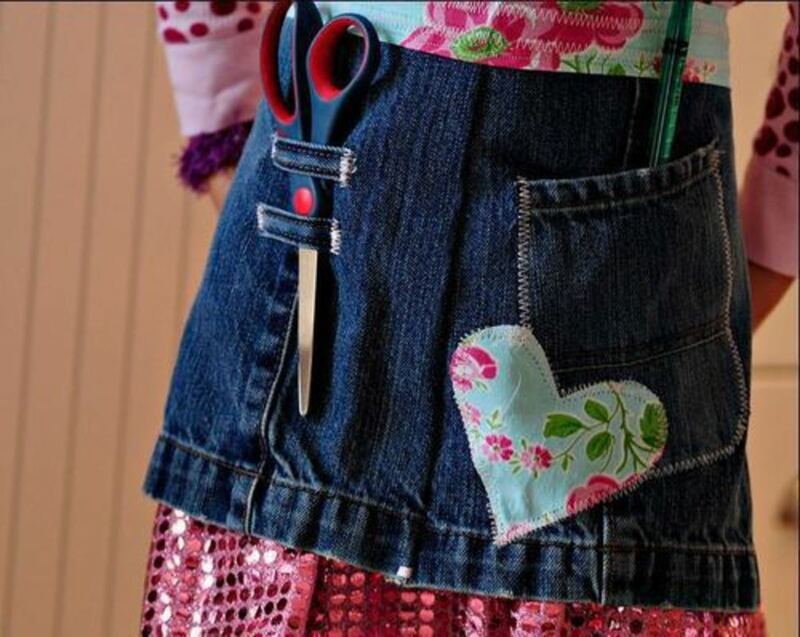 You'll find the tutorial for making this shabby chic apron at The Country Farm Home. 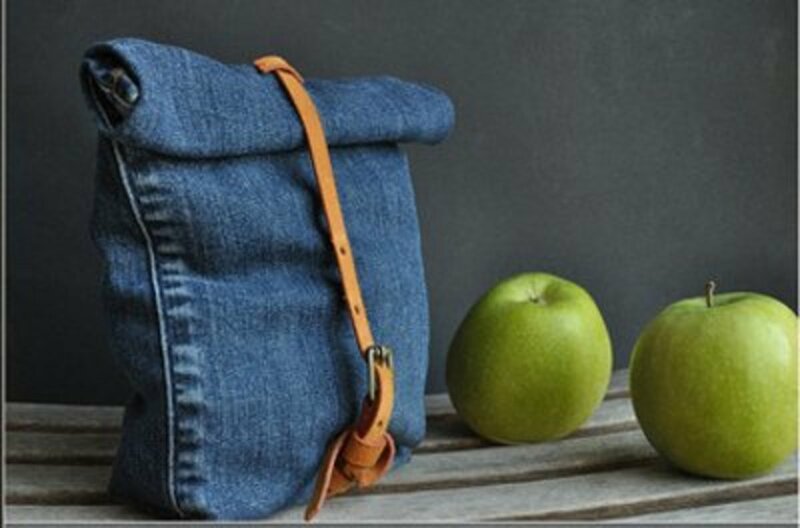 No matter where you go, this fashionable denim snack bag makes an attractive carrier. 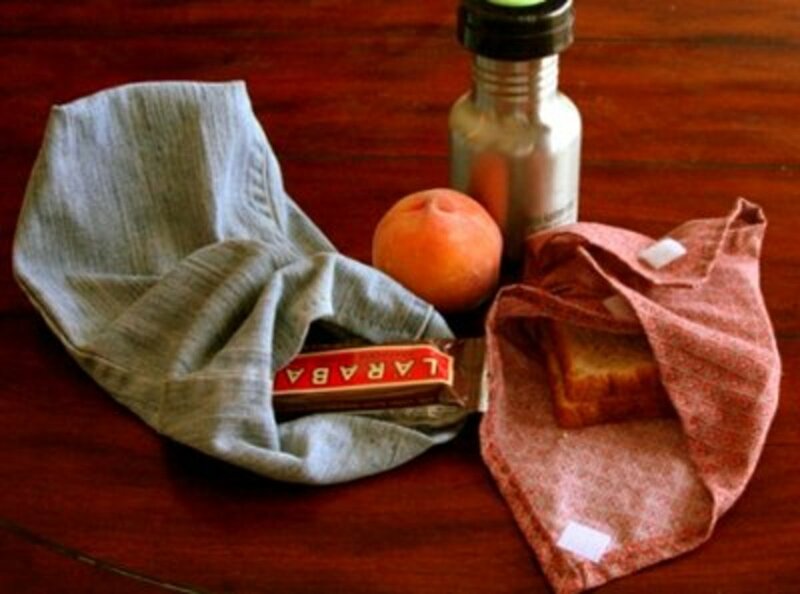 Instructions to make this impressive snack bag can be found at Between the lines. 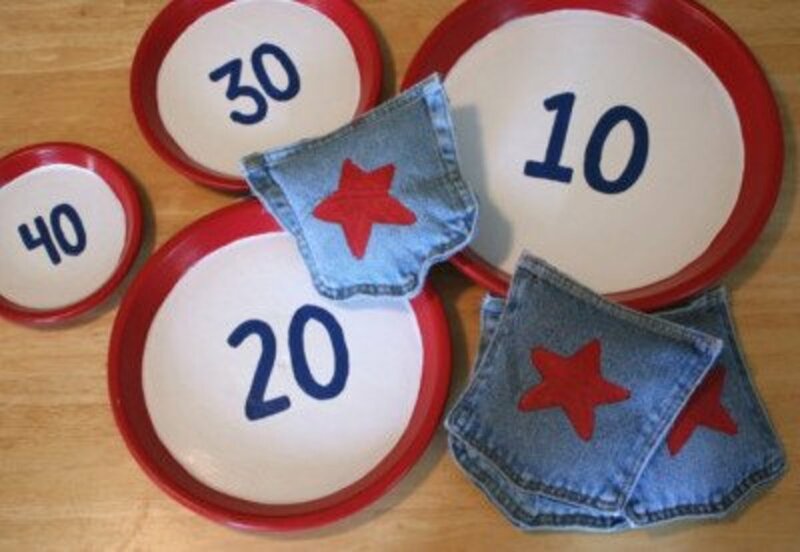 Use denim placemats with your country theme décor or for picnic or patio parties. 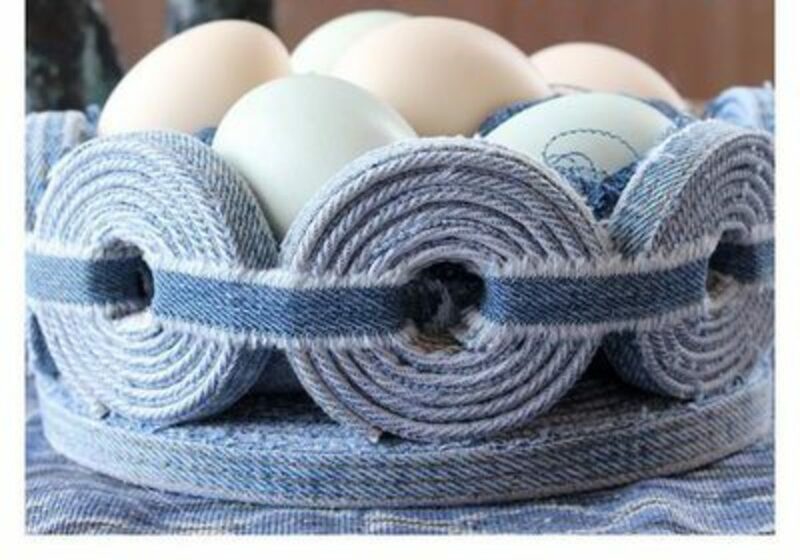 You'll find the tutorial for making these creative denim placemats at TODAY'S NEST. These are so beautiful and useful. 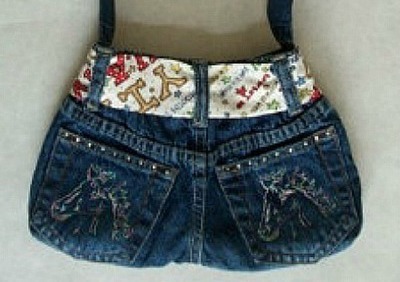 You'll get many more years of use out of those old jeans when you make an attractive handbag like the one shown above. 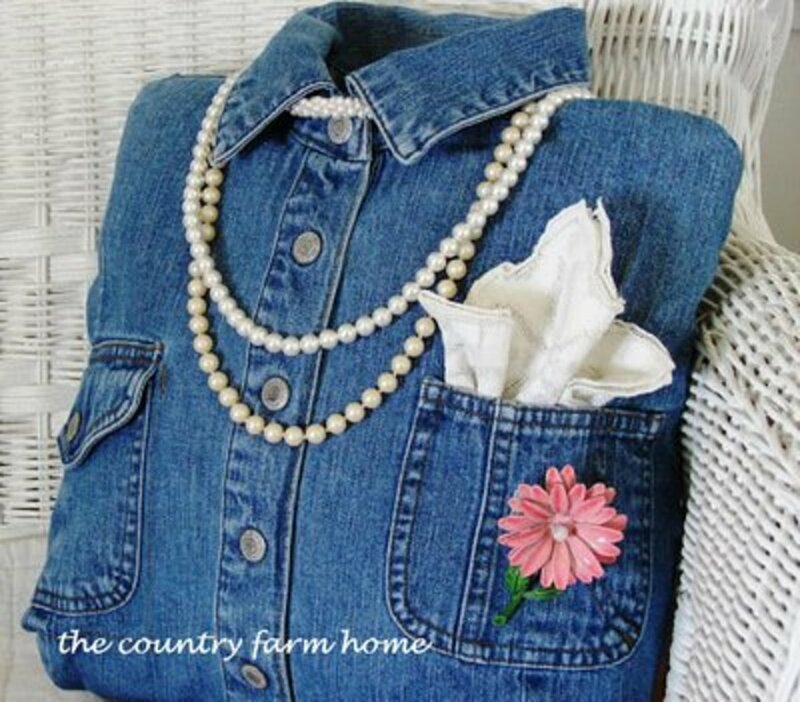 This is easy to make and a very nice purse to accessorize your casual look. Find the tutorial at All Day Chic. I really love it when a recycled item is made into something not only useful, but also attractive. That can easily be said about this denim lunch bag. You'll find the tutorial at the EVERYDAY DISHES site. This would be a great craft show item for selling. You can make these super cute gingerbread man ornaments by following the tutorial given at CraftElf. 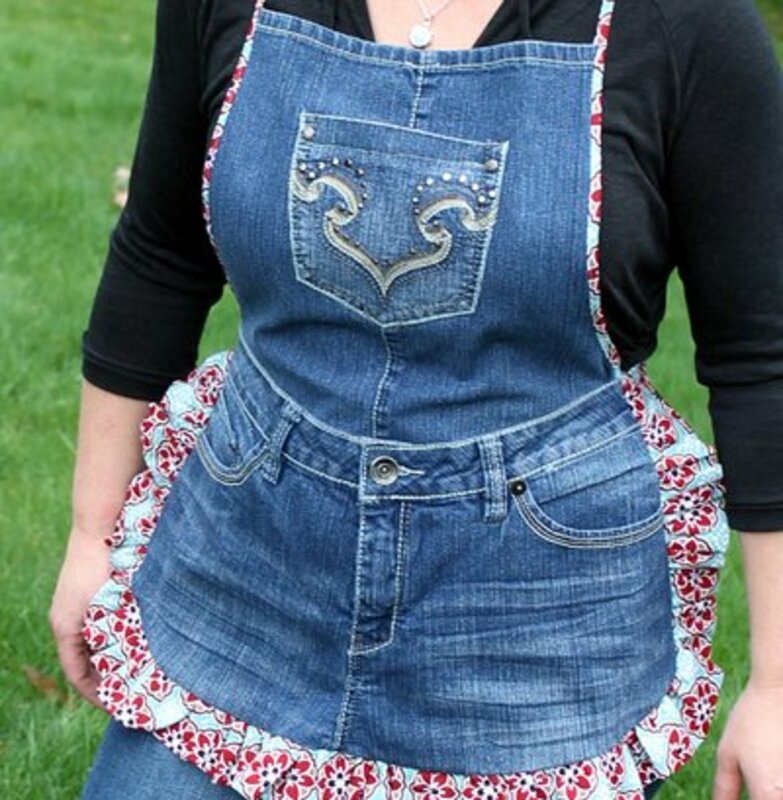 The cute calico ruffle really dresses this apron up. 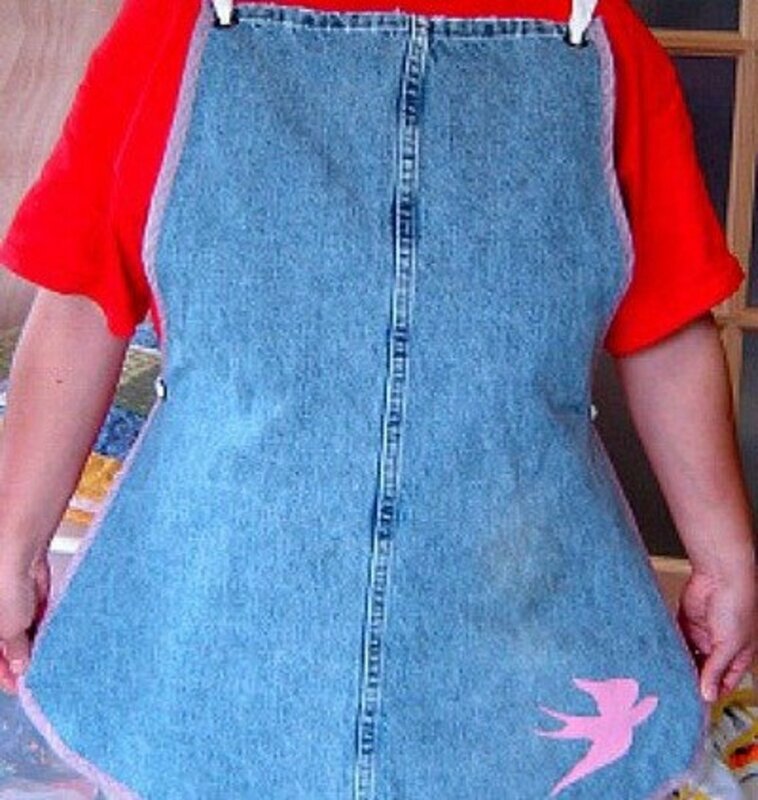 You can make an apron like this one using an old pair of jeans and by following the tutorial at Creative GREEN Living. This is a nice gift idea. 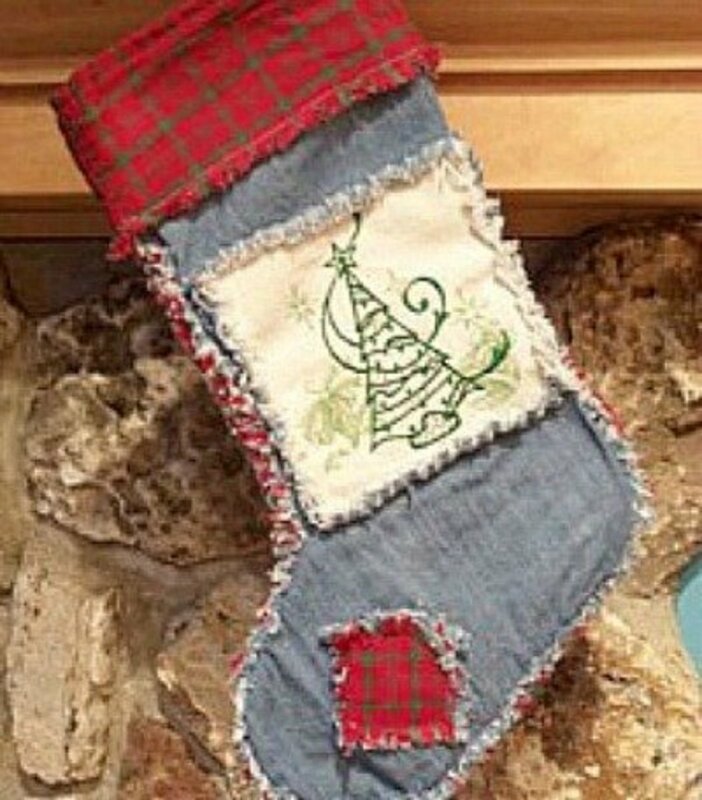 This project from embroidery Library Pojects includes a stocking pattern. Imagine making a variety of stockings using buttons, beads, lace, calico prints, burlap, etc. This video covers how to make a garden apron out of an old pair of jeans. This would be a great activity for a group of girls at a scout meeting or slumber party. Not too difficult and almost immediate results. CRAFTS BY Amanda is where to find the instructions. 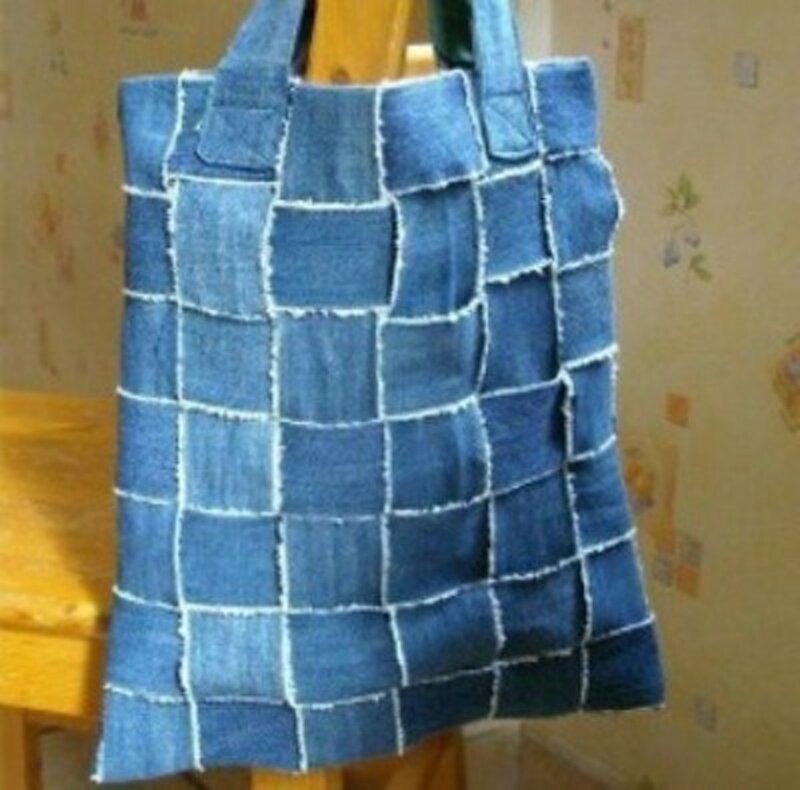 Very cute and easy to make denim purse. Find the directions to make this cute purse at desert willow lane. A perfect accessory to jeans and a tee. THINK CRAFTS has the crocheting instructions for making this scarf. 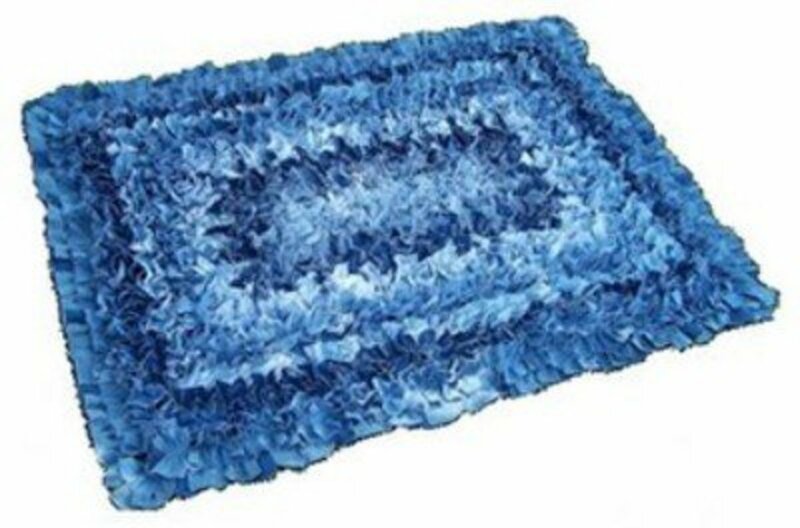 You could likely use the same instructions to make a denim rag rug. 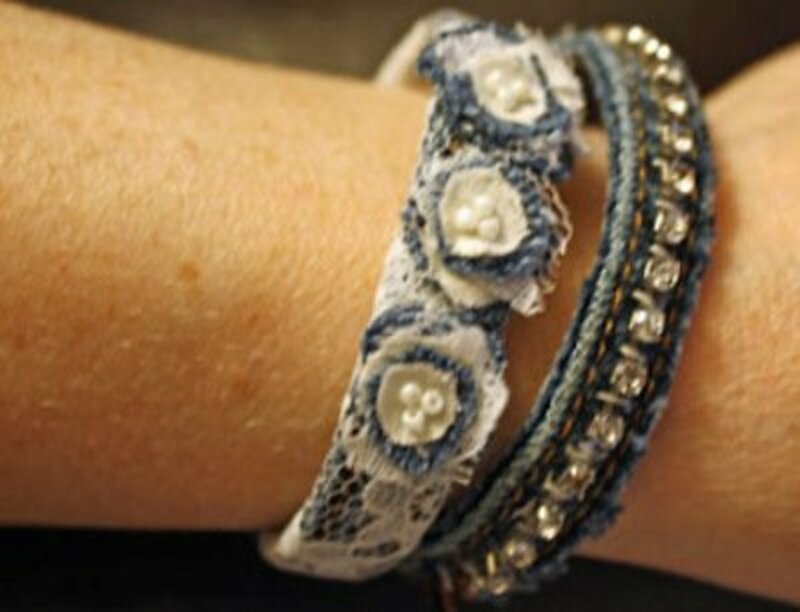 Be the first of your group of friends to make and wear these denim bracelets! Go to Dragonflys and Stars for the directions. How stylish is this!? 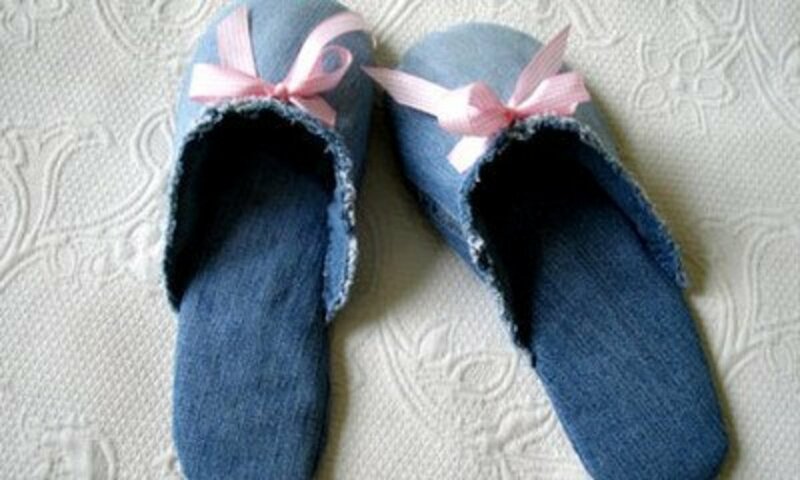 What a great idea for those worn out jeans. Go to The Guardian for instructions for this project. You'll be able to think of plenty of uses for these eye catching containers. You'll find the instructions at Up Craft. 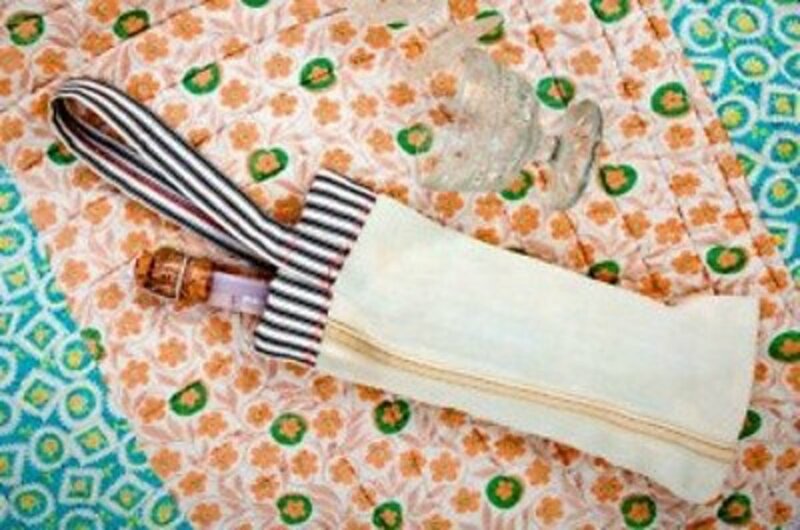 Make a winebag like this to give as a wedding shower gift. 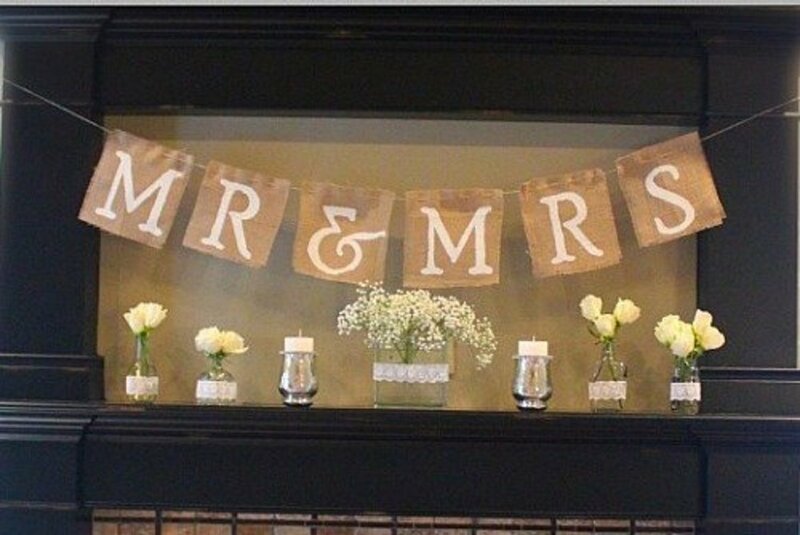 It is something the newlyweds will find both useful and fun. The directions for the wine bag are at Design Sponge. 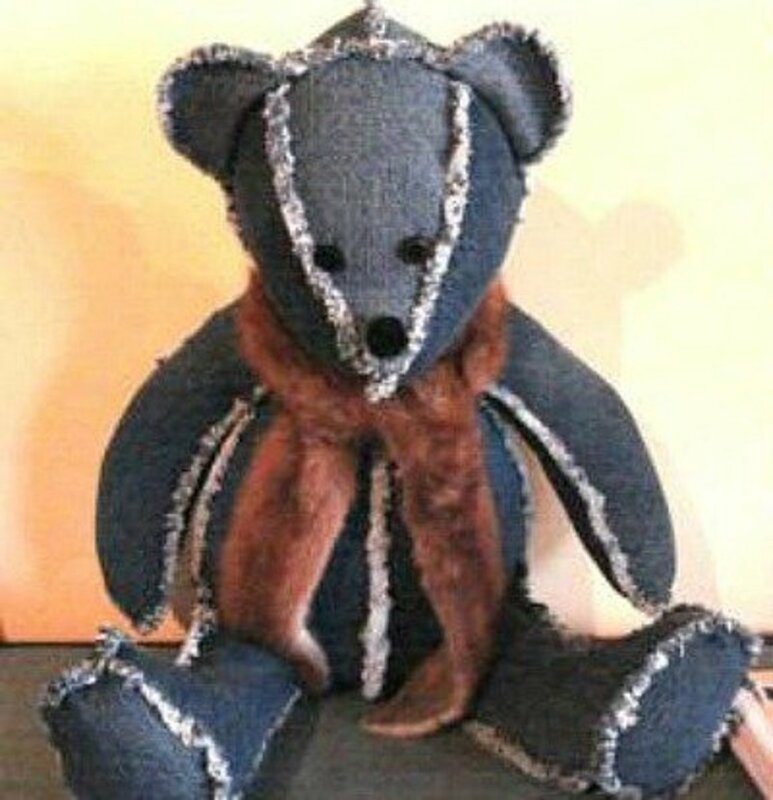 Use whatever bear pattern you want, easy or more advanced, and make a raggedy bear. You'll get the directions by going to Info Barrel. This would be a great gift to make for a high school graduate to take along to college. So pretty and useful. The instructions for this project are found at Oh Oh Blog. 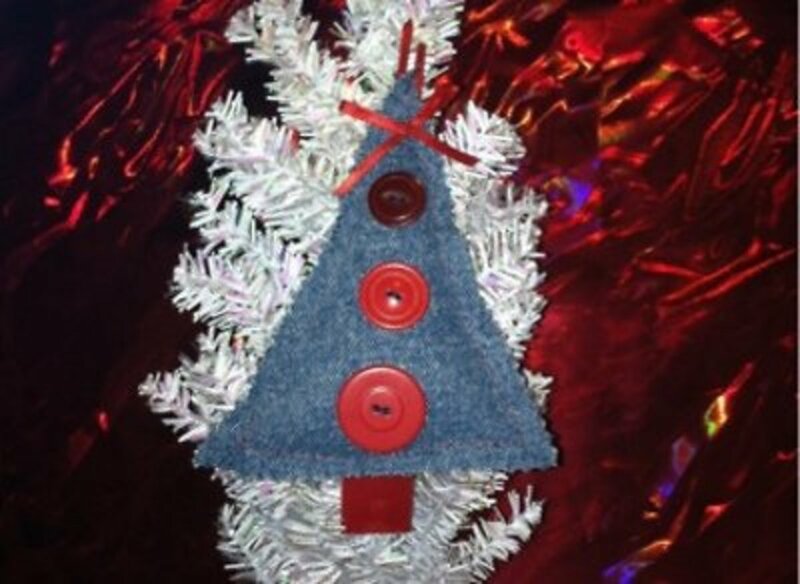 Imagine your Christmas tree filled with these shabby, chic ornaments. 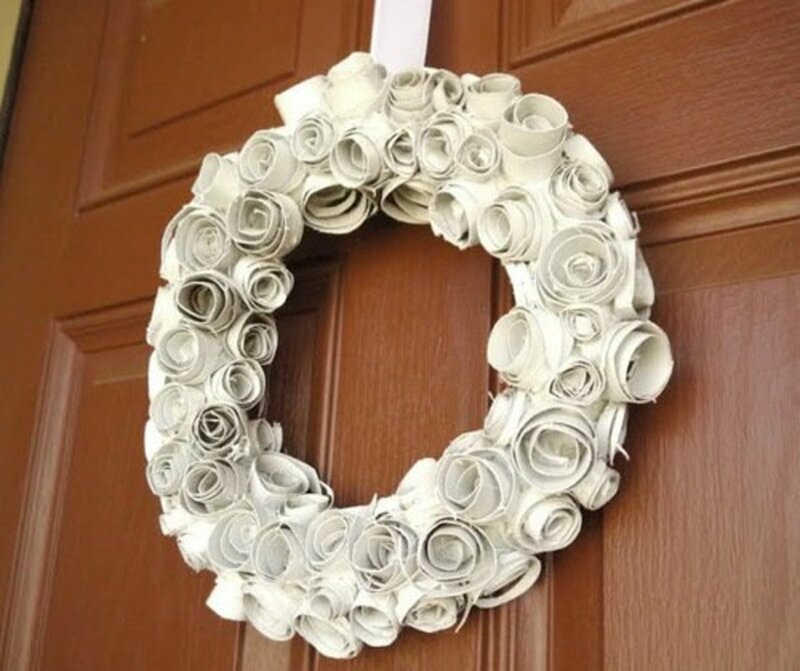 Find the instructions for making them at Craft All Things. Make a nice, no nonsense apron to wear while cleaning or grilling. Simple and practical. Find the directions at My Byrd House. 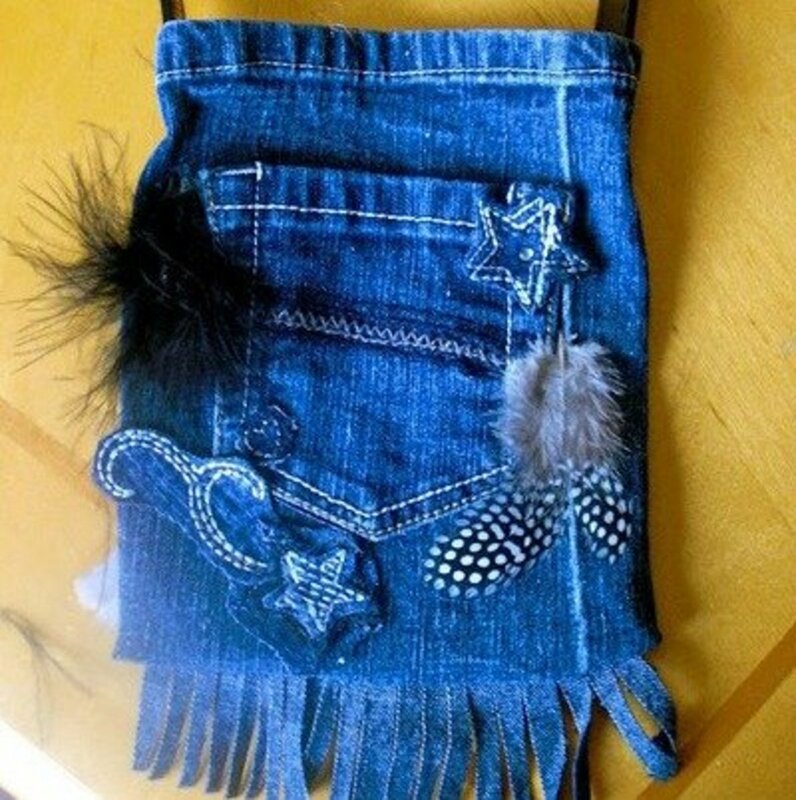 This is one of the cutest denim purses for teens that I've seen. Make this great project by going to girl mogul for the instructions. The only thing left of the jeans is the hems? 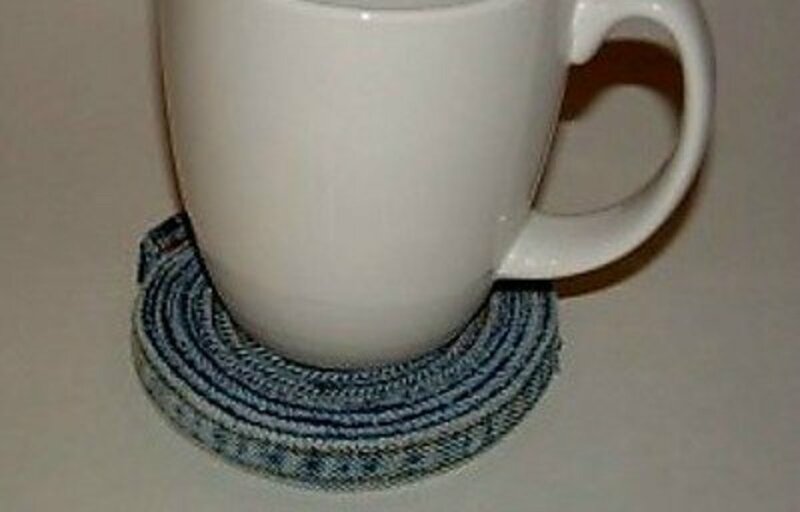 Use them to make these coasters. You'll find the directions at Craftster. 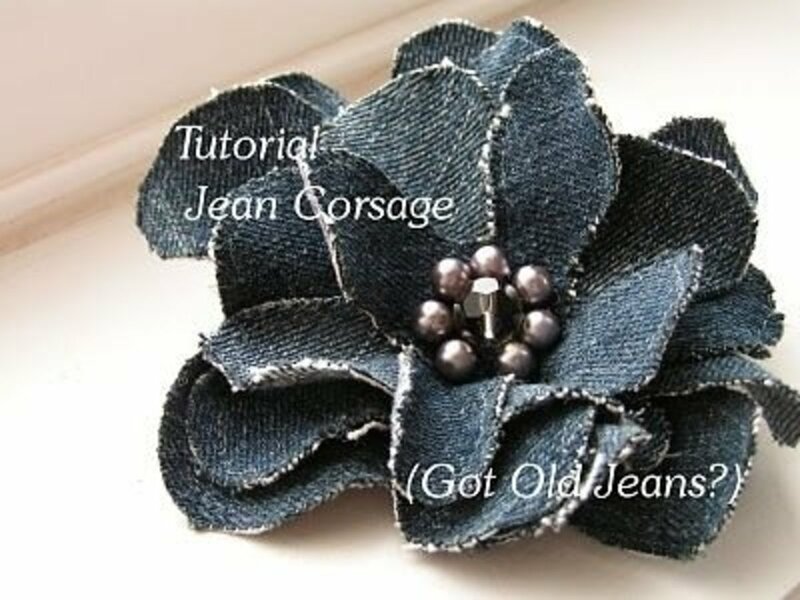 Making a wreath from old denim jeans is remarkably simple. 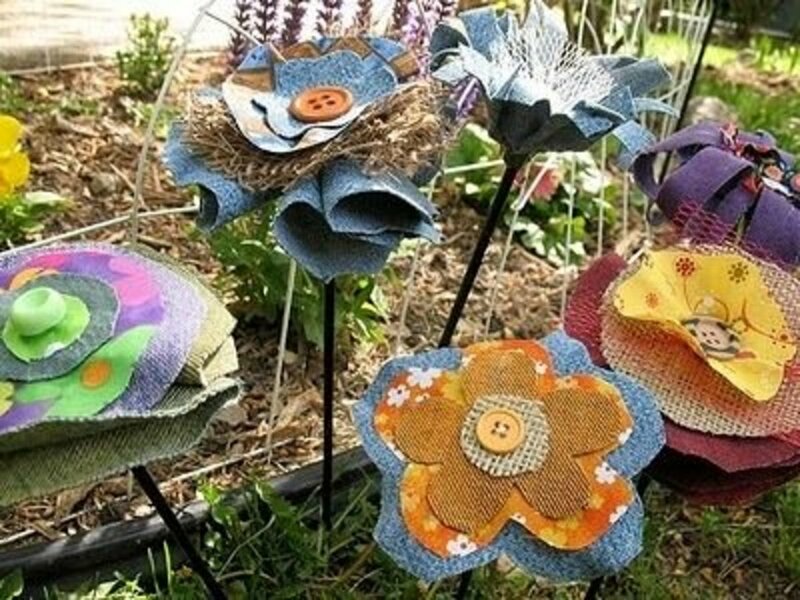 Go to A Fish Who Likes Flowers and follow the instructions there to make this rags to wreath project. I love the look of this quilt and I think it would make a great gift for a graduate or newlywed. Learn how it is made by going to Love to Sew. 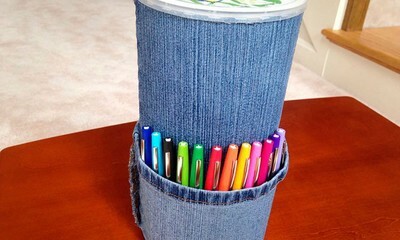 This is a great use for not only the denim, but also for an oatmeal box. 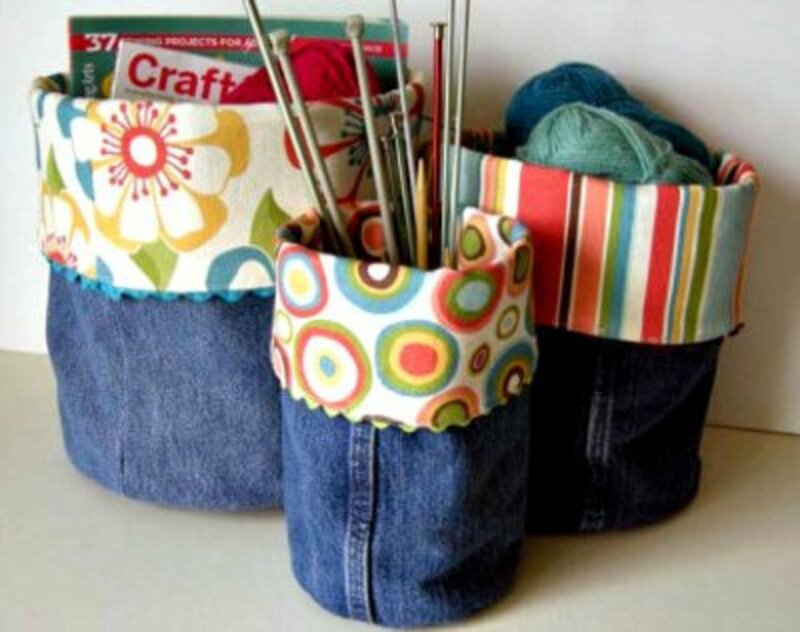 This really useful storage idea has instructions at the ART IDEAS CRAFTS site. Make a ho-hum school necessity into something you can be proud to tote around. Go to Living Well Mom and see how it is made. Make easy and practical napkin rings. Between Naps on the Porch has the instructions for how to make them. 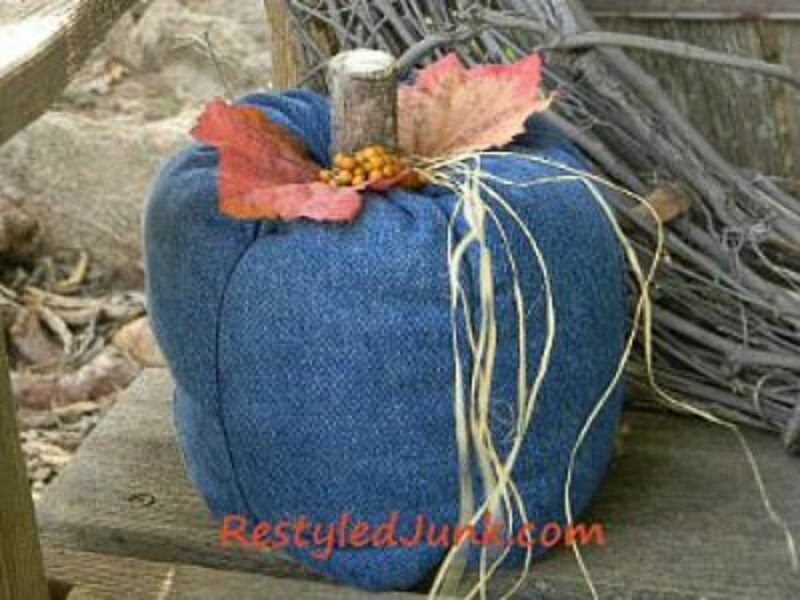 Make this attractive denim country pumpkin by following the tutorial given at favecrafts. This is one of the crafts that I think make a nice piece of décor any time of the year, especially if displayed in the kitchen. 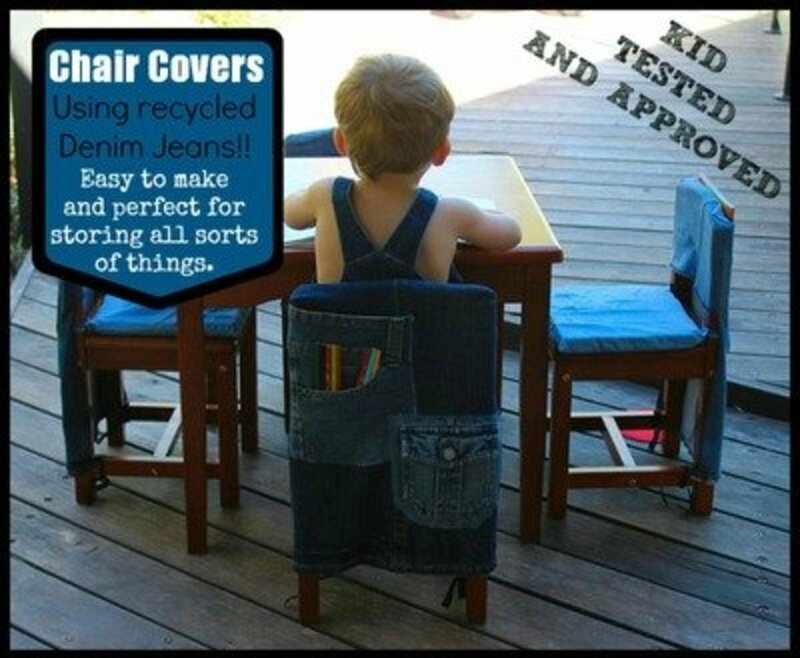 This is a great way to recycle old denim jeans or shirts. It would be a nice gift for a teenager or college student. Go to AllFreeCrafts.com for the instructions. 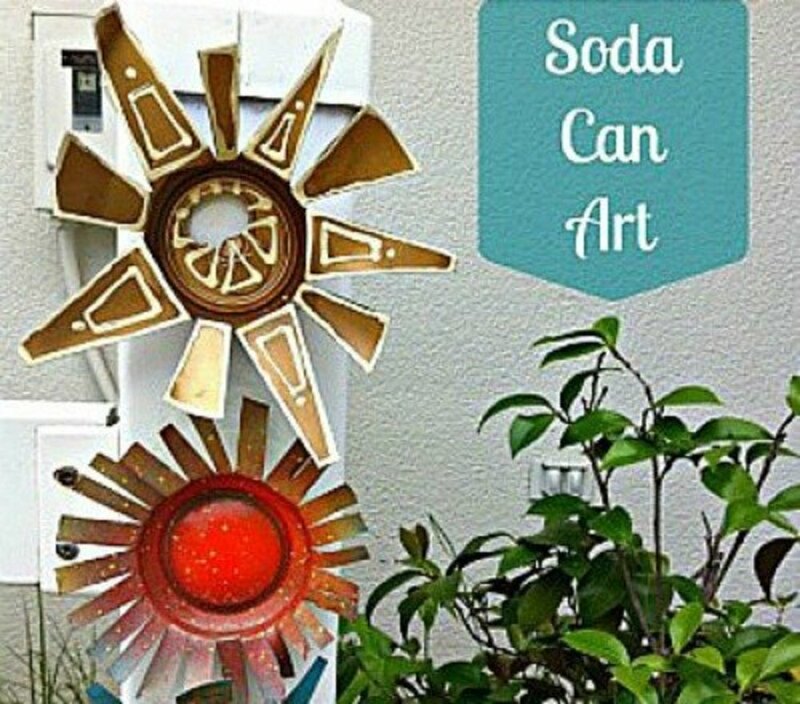 It never fails to amaze me, what dedicated crafters can come up with in the way of recyclables. 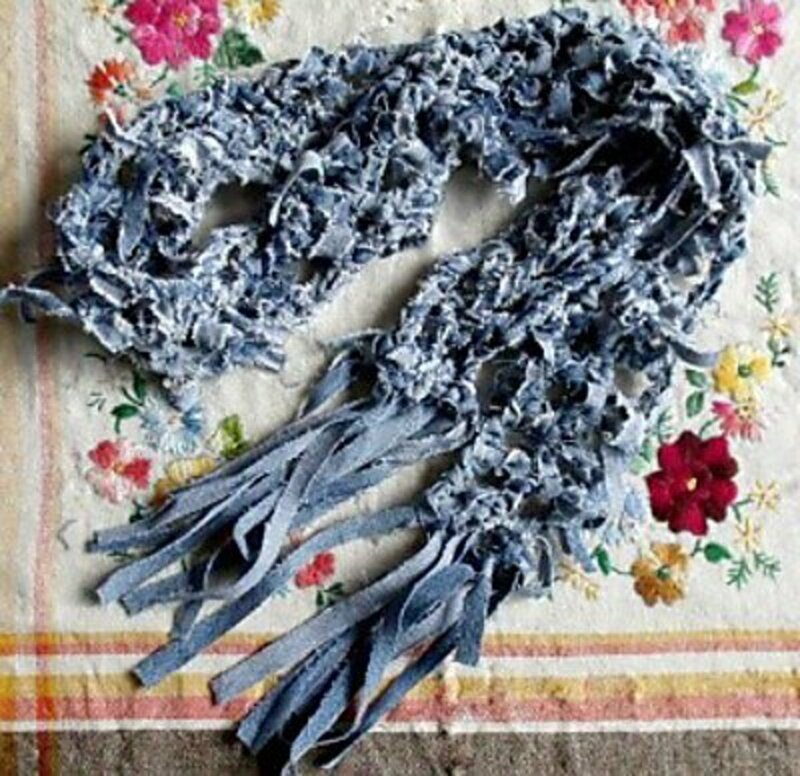 This rosette headband is no exception, as it is uses old denim jeans to create a beautiful wearable. 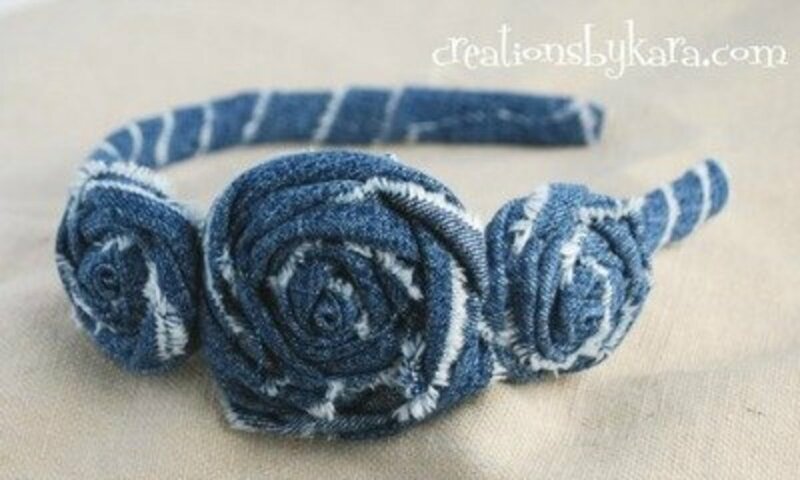 Find the instructions for this rosette headband at Creations by Kara. 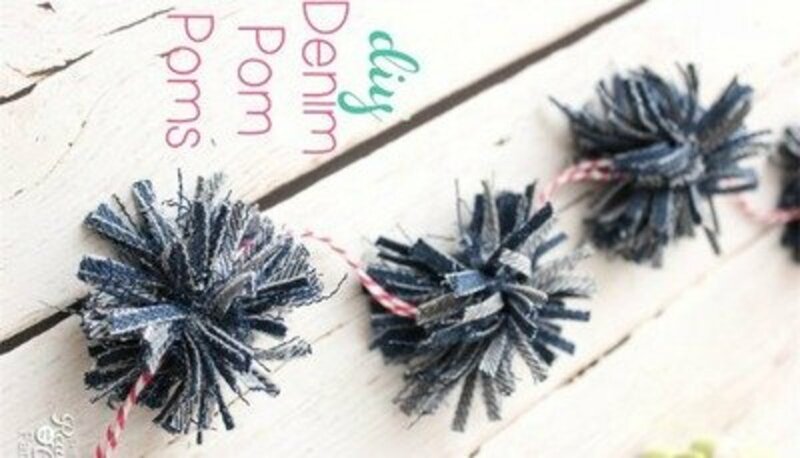 You'll find many uses for these darling pompoms. Easy to follow directions are found at The Real Thing Coake Family. 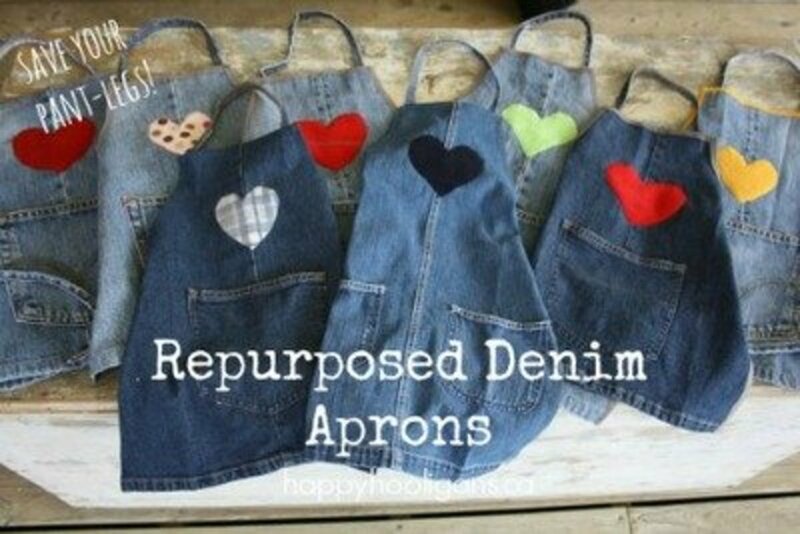 You'll be able to get two aprons made using just one pair of jeans. Find the instructions for making this kids apron at Happy Hooligans. I think this would be an outstanding item to sell at craft shows. 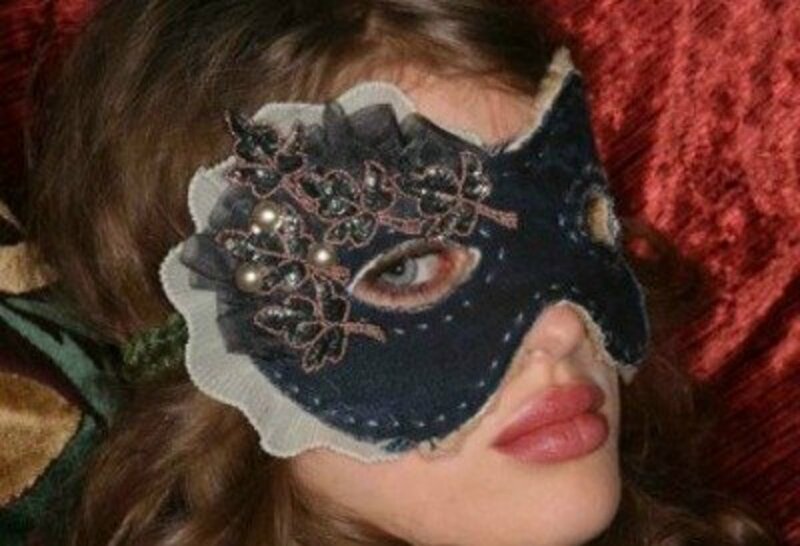 Imagine all the ways you could decorate this denim mask to make it one-of-a-kind. For the mask pattern and tutorial, go to the Make: site. 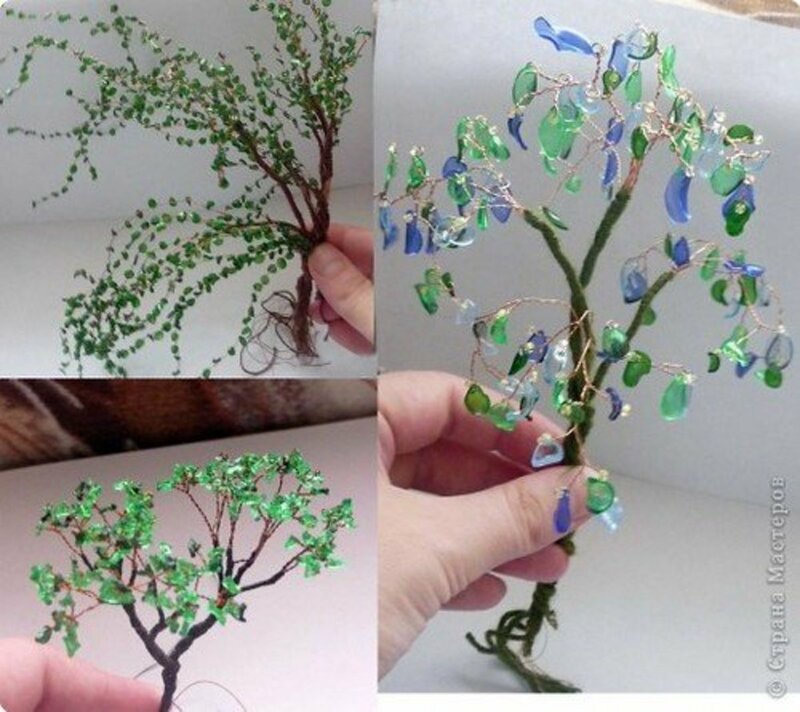 Imagine using fabric paints with the jewels and lace. 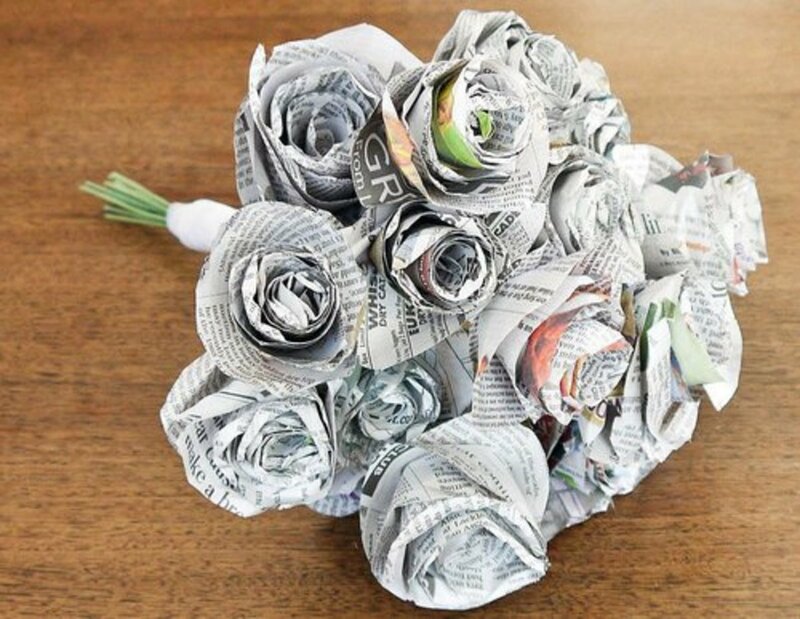 Amanda always has cute items to make and these flowers are no exception. Check these beauties out at crafts by Amanda. Make this beautiful corsage following the directions given at Tea Rose Home. 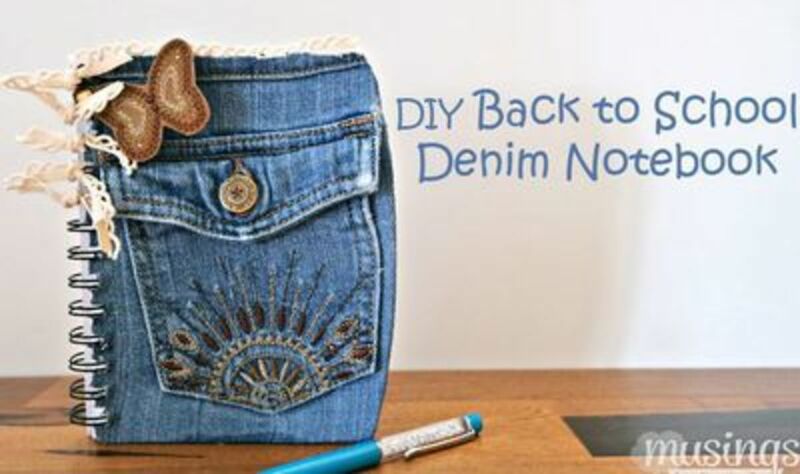 Learn how to make a denim backpack using old jeans in this video. PYSSELBOLAGET gives instructions on how to make these useful baskets using the legs of jeans. 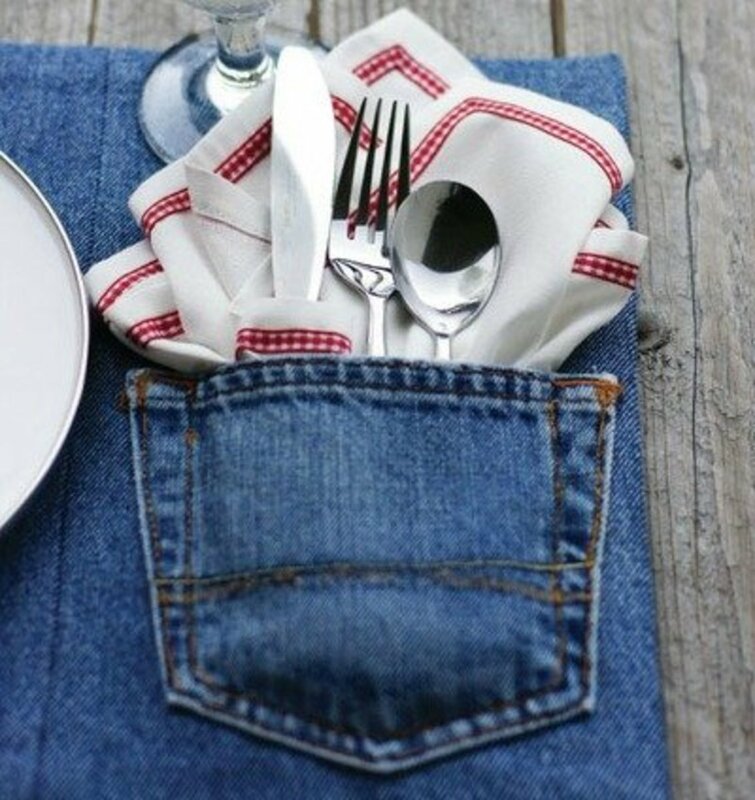 If you like to set an attractive table to serve a lunch on the patio, I can't imagine a nicer touch than this cutlery pouch. You can find out how to make this pouch by visiting the AllFreeCrafts.com site. 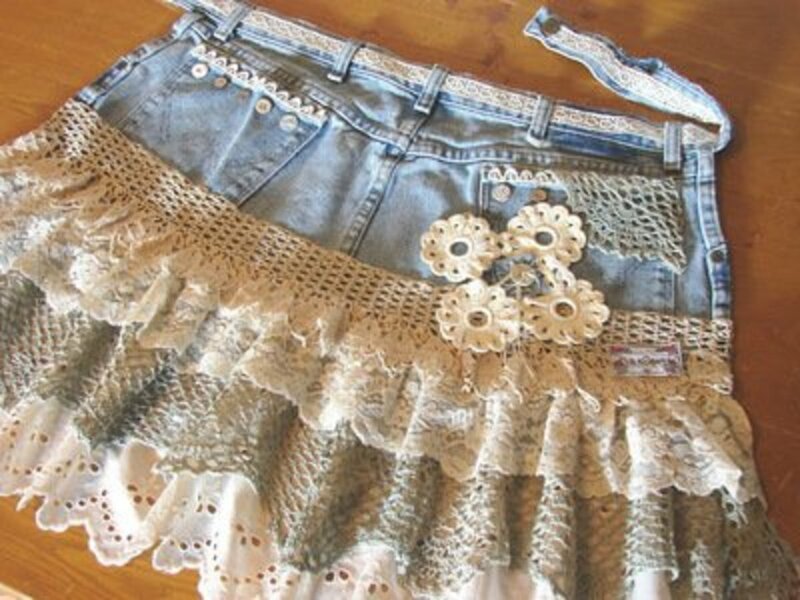 This would be so cute worn with a tee shirt and jeans. I really love this look. Go to Little Miss momma and see how she made this beauty. Are you tired hunting for sacks to send lunches in? The kids will be happy to tote this worn-looking sack to school. 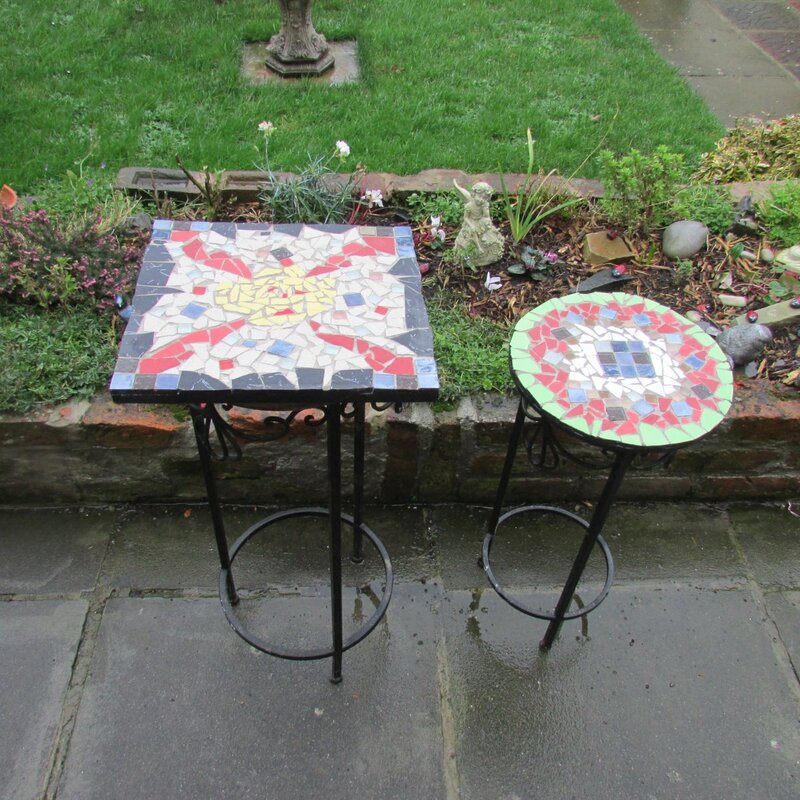 Find out how to make this project at make and takes. 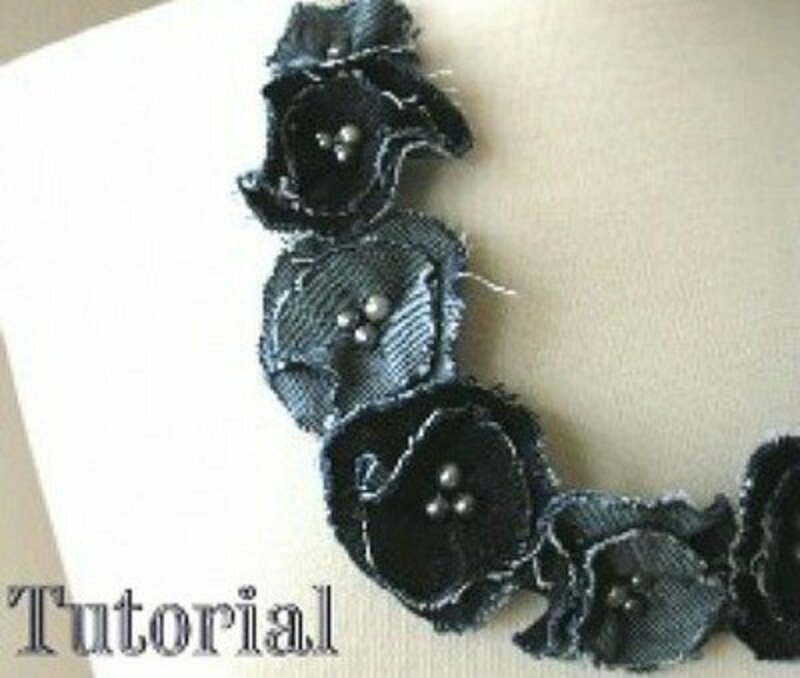 The instructions for making this denim flower necklace can be found at Tea Rose Home. Who would have thought that denim could be made into such an attractive accessory? 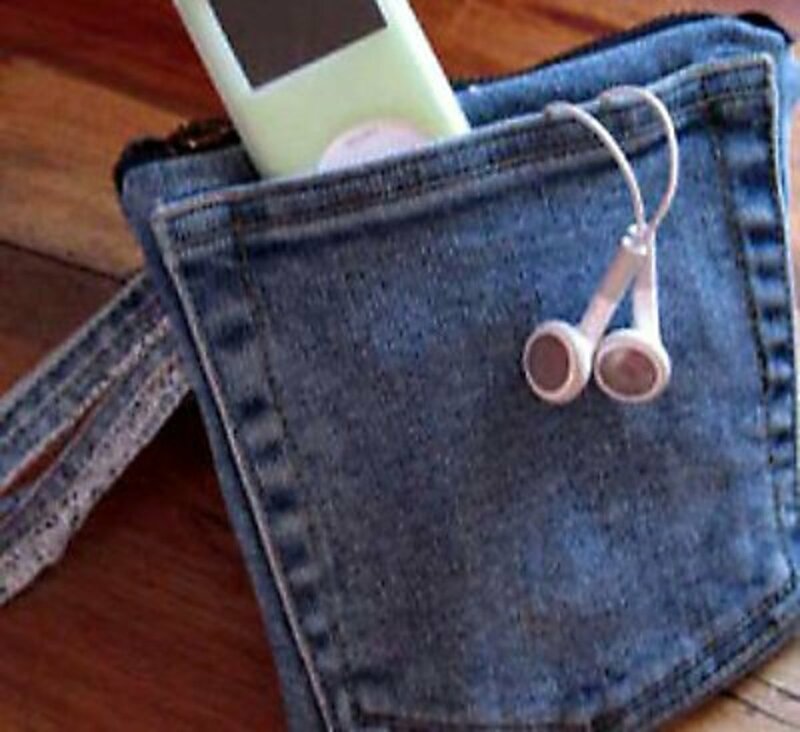 A cool place to carry and protect your electronic gadgets. Go to instructables for directions on how to make it. Cameras are expensive and need to be carefully cared for. 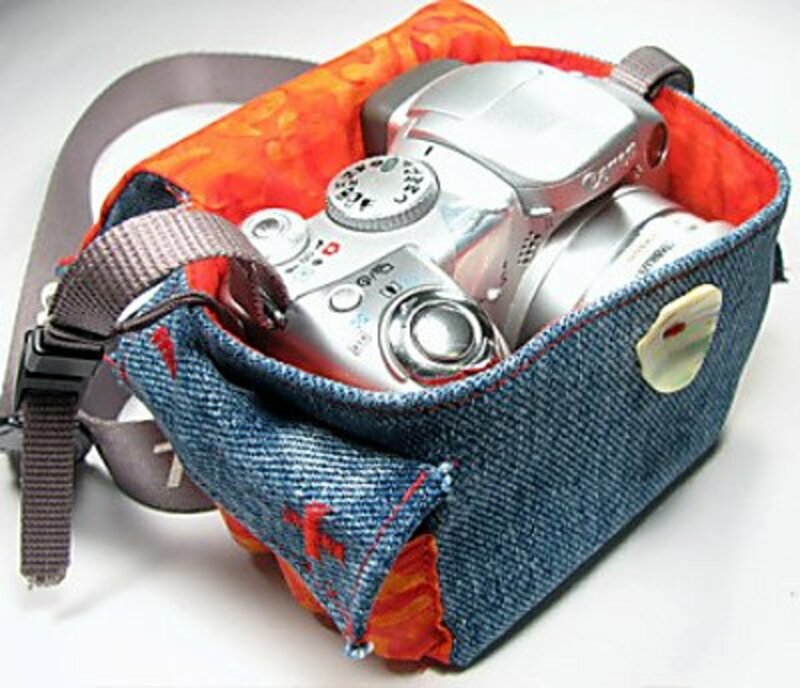 Make your camera safer by making a camera bag like this to protect it. The directions for making this bag can be found at Evil Mad Scientist. This is another of my favorite jeans projects. Covering a plastic bucket ... how ingenious? There are so many ways to use this and if it gets dirty it's easy to clean. For the directions, go to diy Inspiration. This video explains how to make fashionable shorts out off old pairs of jeans. 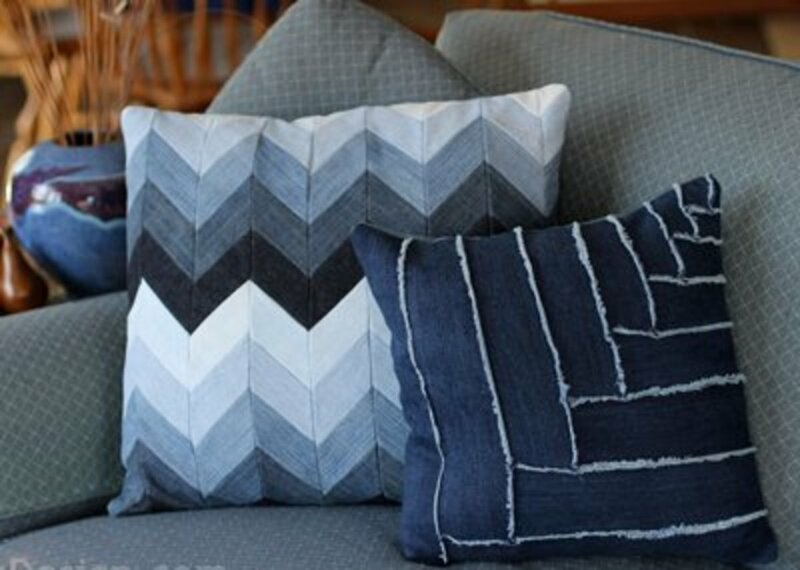 If you are searching for an unique gift to make for the man in your life, consider this chevron denim pillow idea. 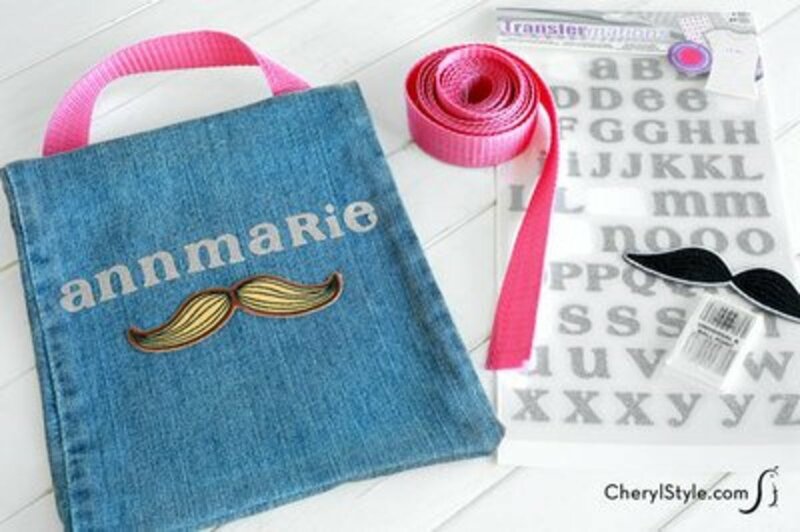 You'll find the tutorial at Ashbee Design where you'll see other denim pillow designs. I think this is such a cute skirt, my granddaughters would love it. Although the Mirtesen site is written in a foreign language, the pictures do a great job of explaining how to make this skirt. If you crochet, there are pictures to guide you. I think I would just buy a nice cotton lace edging instead. 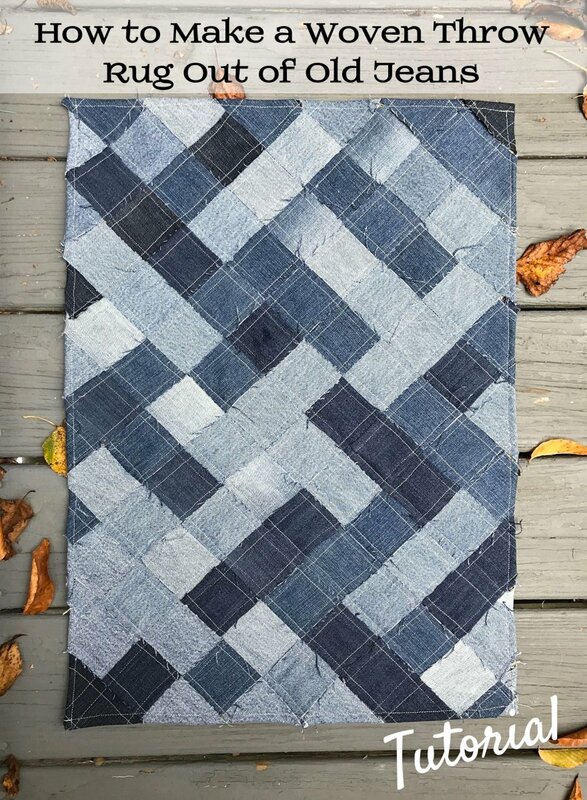 Are there any visuals available for old denim jean crafts? Please click on the highlighted words in the paragraph below the pictured project. The tutorials are available on the highlighted site. Love all of the ideas, great to have them all in one place! 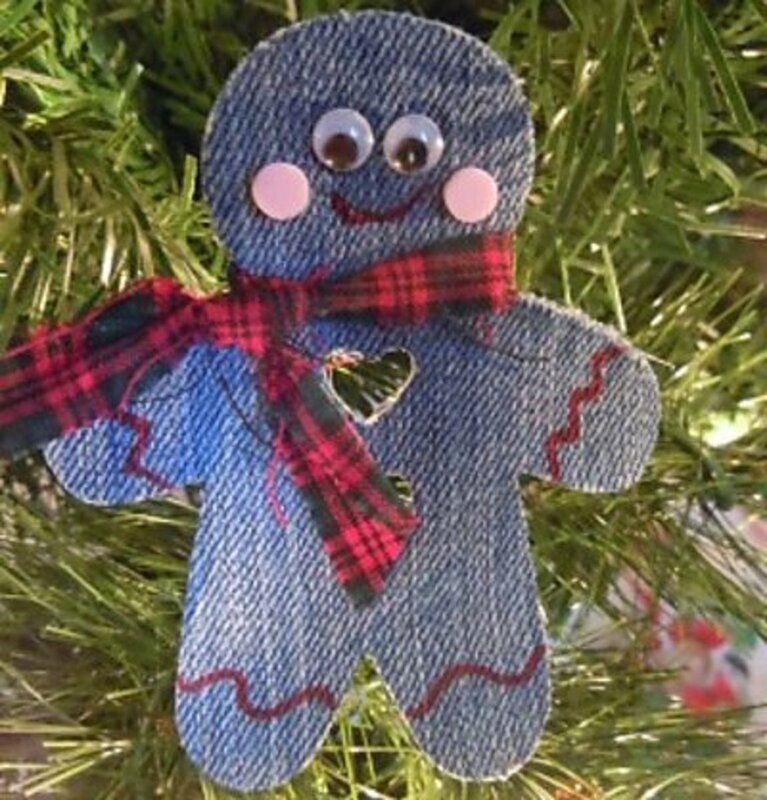 Great job and so many blue jeans crafts to choose from. I really like the placemats idea. The bracelets really are attractive. 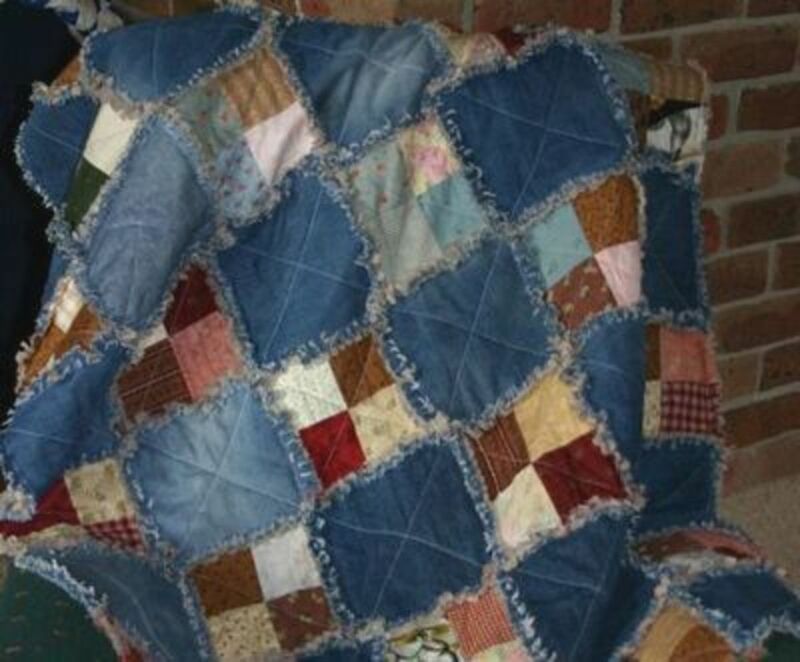 Who would have guessed that so many nice items could be made using worn out jeans. Crafters are amazing. I've never seen so many denim ideas. I love how it can also be used as a bib. A few that I haven't seen before. Love the bear! Wow . Some excellent ideas. 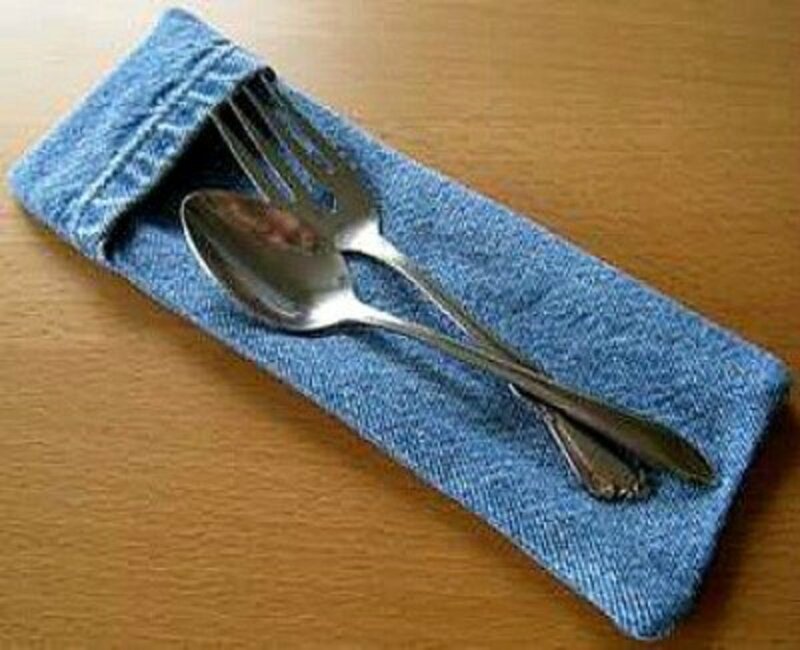 Just showed it to my wife &amp; she's going to make use of some old jeans. Cheers . Thanks for sharing this lens. There are some ingenious ideas in this lens. Bravo! I have so many pair of jeans that are waiting to become a craft. I started saving them when I was making blue jean purses. 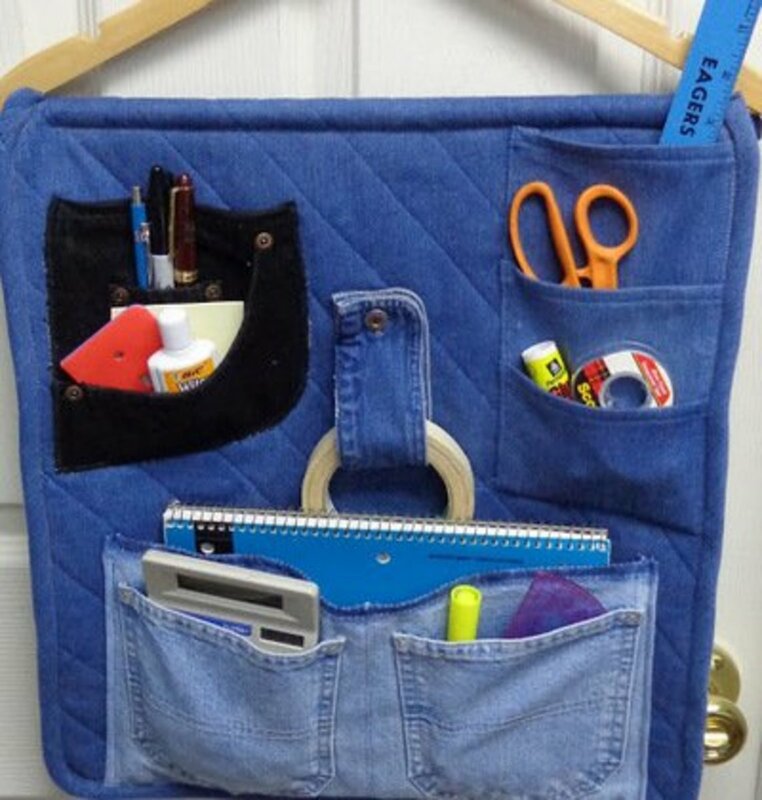 These other jean crafts here would be great to make also. So glad I found your page. I love blue jean crats, but you found some ideas I've never thought of. I loved your suggestions! I would like to make myself a pair of slippers! This is one of the most innovative ideas i have seen in 2012. keep it up.